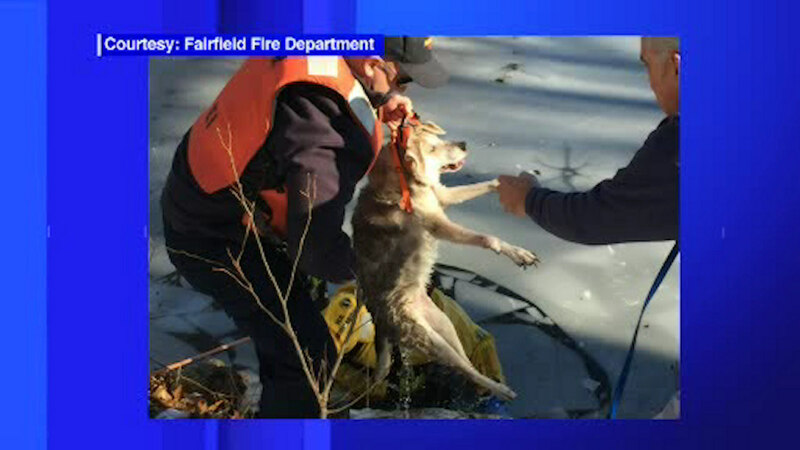 FAIRFIELD, Connecticut (WABC) -- A 19-year-old dog is warm and safe with its family at home after being rescued off a frozen pond in Connecticut. Delilah, a shepherd mix, wandered out onto the pond Monday morning and became stranded. The owner was unable to get to her, so a rescue team was brought in for the risky maneuver. "If the owner had attempted the rescue himself and fallen through the ice, the end result could have been tragic. At the very least, it would have delayed the rescue of the dog because our priority would have been to rescue the owner," said Asst. Chief Gomola, the incident commander. "This is the season for thin ice and animal rescue. We urge parents to talk with their children about ice safety and to immediately activate the 911 emergency systems if a pet or a loved one falls through the ice." The team was able to pull Delilah to safety.